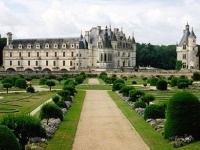 Only a few miles outside Tours, on the River Cher, the Château de Chenonceau is probably the most celebrated of the many châteaux in the Loire valley. It was used as a mill in the Middle Ages and bridges the whole width of the river. It was owned by a succession of powerful noblewomen including Henri II's mistress, Diane de Poiters, the Queen Regent Catherine de Medici, and Louise de Loraine, and is often referred to at the 'Château des Femmes'. Inside visitors can see a wonderful 200 foot (61m) gallery, Louis XIV's sitting room, and Francois I's bedroom, among other things. The castle boasts rich collections of furniture and art, including an exceptional museum collection of the Old Masters' paintings including works by Murillo, Rubens and Le Tintoret. It also has famously lovely gardens. There is a gourmet restaurant, a self-service restaurant and a tea room (open daily from 3pm to 5pm) at the chateau. A free audio guide is available in 11 languages.